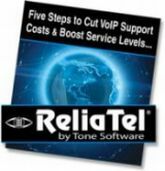 Managing VoIP call quality, UC networks, and SIP service levels can be full of headaches that drive up your support costs and eat away the business ROI of your convergence projects. If you're still using another tester, it is now the time to trade-up to the DTX! The DTX is the #1 name in copper and fiber certification. Trade-in your old tester of any make or model* and you can get a cash rebate for up to $3500 when you buy a new DTX CableAnalyzer through March 31, 2011. Download the form and trade-in your old tester today. What if distance was not a limitation when connecting surveillance cameras powered by PoE? What if you could daisy chain cameras along a fiber route? Visit the PoE and Fiber Resource Center and learn how to extend distances to IP Cameras and other PoE devices.